Apple first introduced its pride Apple Watch face during the company’s Worldwide Developers Conference (WWDC) in June. Inspired by the rainbow flag, it’s designed to celebrate gay pride and stand against discrimination to LGBTQ people. Reddit users and Apple support forum users have been questioning the lack of a pride watch face in Russia over the past couple of months. The Verge has tested this on an iPhone running the latest iOS 12 beta, and the pride watch face simply disappears once you switch to the Russian locale. Russia implemented a “gay propaganda” law in 2013, which the European Court of Human Rights ruled reinforces prejudice and encourages homophobia. The law comes with the threat of jail time and fines for what Russia deems to be offensive speech. Apple appears to be avoiding this particular legal quandary. 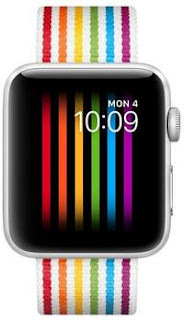 Apple sells a special pride edition Apple Watch strap, donating a portion of the proceeds toward LGBTQ advocacy organizations. But it doesn't sell it in Russia, either. Google targeted Russia’s anti-gay laws with a rainbow Olympics homepage during the Winter Olympic Games in Russia in 2014. The Google homepage, including the Russian version, was changed to show a rainbow-inspired Google Doodle and the Olympic Charter, which calls for the Olympic spirit of no discrimination of any kind against every individual practicing sport. We’ve reached out to Apple to comment on its pride Apple Watch face, and we’ll update you accordingly.